It’s time once again for the McKenna Claire Foundation Golf Ball Drop. For those of you that were able to attend our Friday Assembly, you had the opportunity to hear Dave Wetzel, co-founder and McKenna’s father, speak about Eader Elementary’s close connection with MCF. Over the past 5 years, MCF has donated over $75,000 to local schools in partnership with the Play It Forward Golf Tournament and Golf Ball Drop. Eader Elementary will receive 50% of ticket proceeds for every ticket sold by Eader students. The first ball in the hole or closest to the pin will win $2,500!! All purchased tickets will be assigned a golf ball and be part of the helicopter ball drop on October 19th. Tickets are $10 each and winner need not be present. Click HERE to see a video of the Ball Drop! All tickets and money are due back to the school on October 12th. Please make all checks payable to MCF (McKenna Claire Foundation). Additional tickets are available in the office! 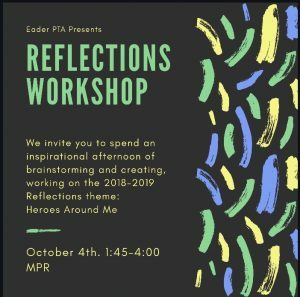 Please join us this Thursday for a creative workshop in the MPR! The PTA will have a variety of supplies on hand (paints, chalk, paper, pencils, etc.) to get those creative juices flowing! Every grade level from Pre-School to Fifth Grade is invited to join us. In addition, we will have Reflections entry forms on hand. The PTA looks forward to seeing you there! 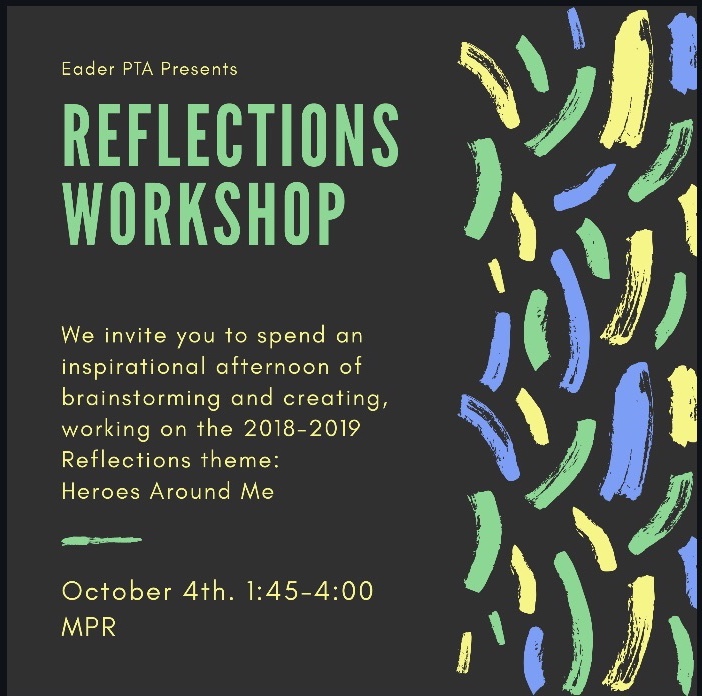 Please visit the CAPTA website HERE for more information on the Reflections program.